The release of a new book written by a recently-retired Catholic priest intended to encourage open dialogue concerning contemporary issues facing the Roman Catholic Church was announced this week. Titled “Yes We Are! 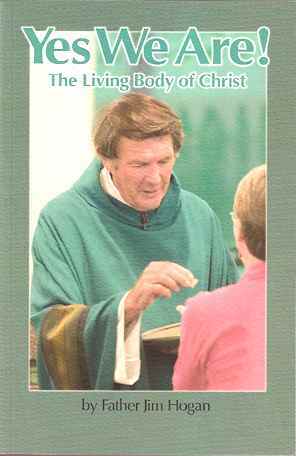 The Living Body of Christ,” the book was written by Father Jim Hogan, who spent 22 years as pastor of Christ The King Parish in Missoula, Montana, and retired in 2006 after 48 years of serving as a diocesan priest in the Roman Catholic Diocese of Helena. The book is an assessment of contemporary issues facing the Catholic Church as well as a call to renewal of the church in the tradition of Second Vatican Council instigated by Pope John XXIII. “In seeking to engage the reader in a conversation that is honest but encouraging, humorous but serious, the book interweaves memories of how things were in the Catholic Church with honest discussion of how things are today,” Father Hogan said in announcing the publication of his new book. Father Robert Egan, a Jesuit priest and professor of theology at Gonzaga University in Spokane, Washington, said in the book’s Foreword that it represents “a heartening example of what we (Catholics) need” and a hope that it will serve “to rekindle our common hope that it will be possible for us to restart the Conciliar renewal.” A key paragraph on Father Egan’s Foreword, has this to say about Father Hogan’s new book: “‘Yes We Are! The Living Body of Christ’ is a heartening example of what we need. Down to earth, full of concrete details, suffused with faith, in a particular place . . . . It’s a prayerful reflection and ongoing interpretation rooted in faith – on a people and their history with God. We could call it: ‘doing theology from life.’ This is what all of God’s People must learn how to do now. Then, with Fr. Hogan, we could rekindle our common hope that it will be possible for us to restart the Conciliar renewal.” Father Hogan had this to say about his new book: “Those of us who were alive in the 1960s fondly remember the name Angelo Giuseppe Roncalli. He lived long enough to get many things right. As Pope John XXIII he invited the Catholic bishops of the world and others to assemble with him in Rome for the Second Vatican Council. It was the largest gathering of this sort in history. His optimistic realism and his vision were contagious. Joyful, exhilarating bells of hope rang out throughout the world as Pope John’s Council ended its work. Much has changed since then. Our world and the churches are different. As our memories of the Second Vatican Council has faded, those who resisted the Council’s vision have persisted in sounding a call to retreat from it. Efforts to rush us forward into the past have dampened the fires that were ignited. Good Catholic folk and many Christians in other traditions are confused and disturbed that the Council’s bright promise seems to be diminishing, so this issue is also important to many Christians outside the Catholic church. ” Father Hogan initially engaged in writing the manuscript that became his book as a form of personal catharsis. Gradually, his purpose evolved as he listened to the frustration, perplexity and discouragement of good people. “The final product is a simple but sincere effort to encourage ordinary folks to keep going on, to be persistent in maintaining and pursuing the vision of the Second Vatican Council and in doing so a new Catholic culture is being born that will replace the former,” Father Hogan said. One reader of the book observes that “Father Jim Hogan has written of his long love affair with the Catholic Church and how it has sustained him through a life of service as a Catholic priest. This hard-to-put-down book gives an insider’s view of how sweeping changes brought by the Second Vatican Council affected parish life in a time of rapid societal, scientific and theological change. This is the story that parallels that of most marriages that are sustained through hard times by love and faith.” Jim Hogan was born and raised in Anaconda, Montana, and was ordained priest in the Roman Catholic Diocese of Helena on May 27, 1961. During his 48 years as a diocesan priest, in addition to pastoral ministry in Butte, Helena, Browning and three Missoula parishes, he taught in four diocesan high schools, St. Patrick School of Nursing, and at the University of Montana. Missoula’s Jeannette Rankin Peace Center named him Peacemaker of the Year in 2000. In July 2006, he completed 22 years as pastor of Christ the King Parish and the Director of Catholic Campus Ministries at the University of Montana. He now resides in Missoula and continues to serve the diocese as a priest in Senior Status. “Yes We Are! The Living Body of Christ” contains 214 pages in 6x9-inch softcover format. It retails for $19.95.